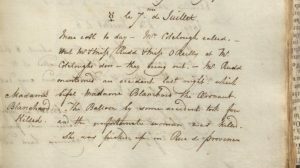 Home › Miscellany › A peek into the daily life of an English doctor in Versailles, 1819-1824 : the diaries of Jonas Asplin, M.D. Amongst the manuscripts in the Osler Library are three volumes that outline in exquisite detail the daily occurrences that one English physician found significant enough to record in his diary. Jonas Asplin was originally from Little Wakering in Essex, but spent five years practicing medicine in Versailles and Paris. 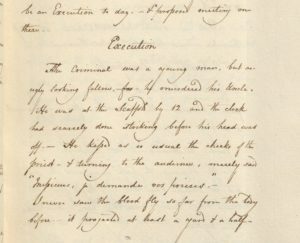 The journals housed at the Osler Library, which cover the years 1819-1824, were recently digitized and are currently being transcribed. 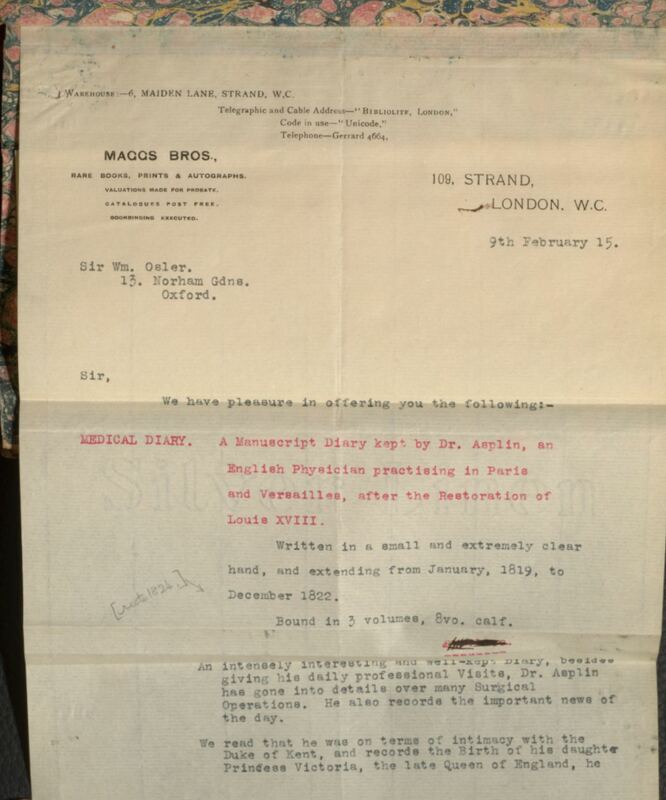 Looking at Asplin’s diaries for a few select days provides a fascinating snapshot of what was important in this doctor’s life. A significant proportion of his remarks are devoted to the weather and to those with whom he socialized, but he peppers his commentary with current events. Not surprisingly, within the accounts of his daily rounds are also remarks on medicine, but these by no means take precedence. In terms of the substance of the entries, each begins with a meteorological summary: the general conditions, often the temperature (in degrees Fahrenheit), and the direction of the prevailing winds. When covering his daily activities, Asplin provides details about the routes he takes, which means that once fully transcribed the diaries could give rise to an interesting mapping exercise; similarly, the names he mentions appear to be those of individuals who were influential in and around Versailles, especially amongst the English-speaking community. Until the full transcript is available, a few excerpts will suffice to provide a glimpse of the three volumes left by Dr. Asplin from his years in France. [vol. I, p. 148] 1819. [Tuesday] le 6 de Juillet. – Versailles. Up at 5. – The weather this morning is extraordinary – there is a very dense fog – flying with a fresh breeze from the N. – at the same time the thunder is pretty general tho gentle from all quarters except the E. without any very heavy clouds. – ½ past 6. Thunder now heavy and general except from the E – Some rain. – The lightening not very vivid – but I never heard so much thunder from such light clouds. – Rains steadily. – 6 ¾ Heavy shower. getting bright in the S.E. – 8. Fine + Sunshine. 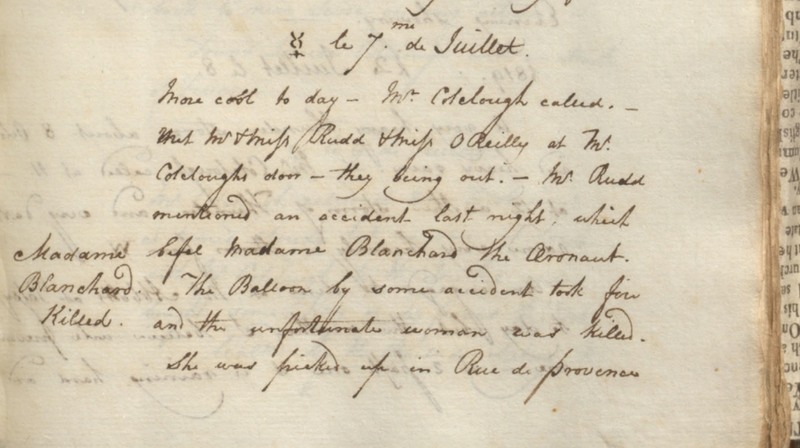 Regarding current events, on Wednesday 7 July, Asplin records the death of the aeronaut Madame (Sophie) Blanchard. The following day, he mentions that the king is going to St. Cloud from the Tuileries, and on 9 July Asplin returns to the man wounded by a soldier while passing judgement on the treatment given to that man by a military surgeon: Walked by the Bois de Satory to [p. 152] the Village of Buc to see a poor man who received a Severe Sabre wound a short time since from a drunken Soldier – it is a deep wound but might be healed by proper treatment in Eight days – but as treated at present by the Surgeon of the Regiment to which the Soldier belonged, it is likely to take as many weeks. – there is a deep descending sinus, which if laid open would heal immediately – But I suppose the Surgeon thinks one wound enough. Charges of Adultery are now formally made against the Queen – + proceedings going on. 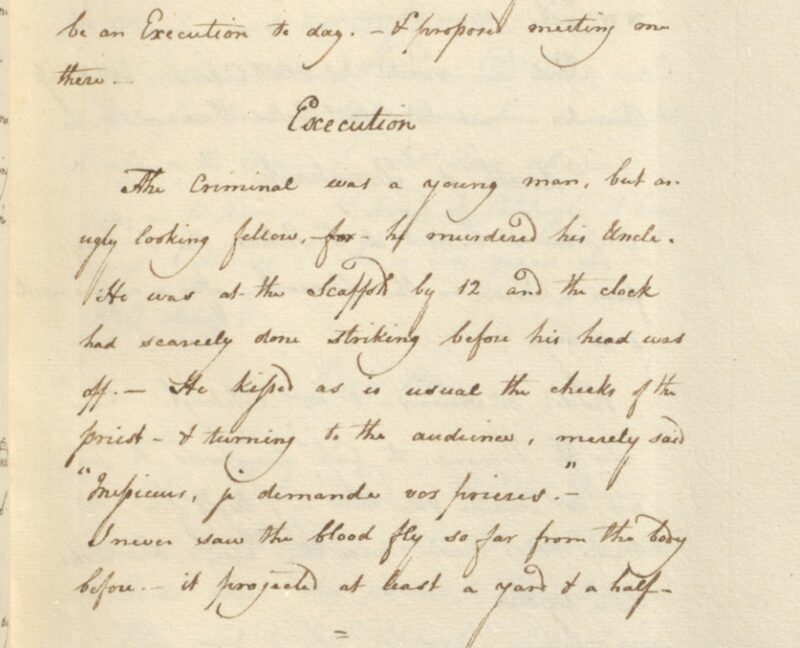 The following year, in 1821, Asplin covers in a public execution in one entry and the reported death of Napoleon Bonaparte the next. Mr. Hull called as did Mr. Bazeley. – rode to Rue de Monsieur + Visited Miss E. Roles + Miss Sherratt. – home – found Mr. Bazeley there – Eliza with Mrs. Gardiner to make purchases. – Hearing of the resignation of the Revd. Mr. Beaver.